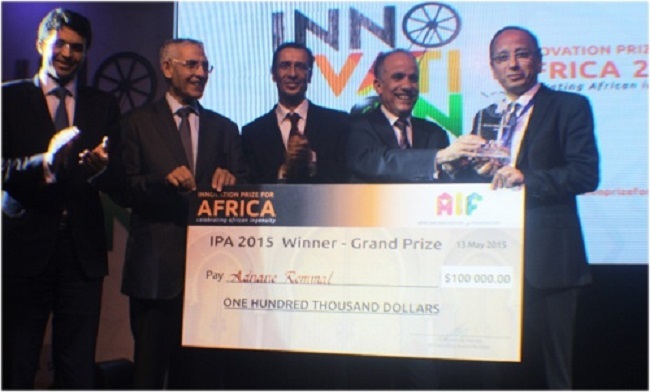 In a glittering ceremony hosted by the African Innovation Foundation (AIF) Moroccan researcher Adnane Remmal was announced winner of the Innovation Prize for Africa (IPA) 2015 Grand Prize, scooping the US$100 000 cash prize in Skhirat, Morocco. Held in collaboration with Morocco’s Ministry of Industry, Trade, Investment and Digital Economy, the May 12-13 event was a fitting tribute to an extensive research process, providing African farmers with a solution to improve livestock production whilst taking into account consumer health needs. Alex Mwaura Muriu of Kenya won Second Prize and South African Lesley Erica Scott was awarded the Special Prize for Social Impact, receiving US$25 000 respectively. A jubilant Remmal impressed the expert panel of judges, competing with 10 excellent African innovations spanning the health, environment, technology and agricultural sectors. His innovation, a patented alternative to livestock anti-biotics is set to transform the broader medical and agricultural sector in Africa. Murui, a Kenyan entrepreneur, developed a system to meet the perennial challenge faced by African farmers in accessing capital to finance planting and harvesting by providing an alternative from the burden of financial loans through his Farm Capital Africa project. Today, TB is second only to HIV and AIDS as a leading cause of death in the continent. Using the Smartspot TBCheck, Scott, a South African scientist, has developed an effective World Health Organization (WHO) approved calibration method for TB diagnostic machines. Innovation is a national priority in Morocco, one of the countries leading the innovation frontier in Africa – a strategic location for IPA 2015, and well known for hosting other successful events such as the Global Entrepreneurship Summit. In his welcome remarks, Moroccan Minister of Trade, Industry, Investment and the Digital Economy, Mr Moulay Hafid Elalamy emphasized: “Innovation and development, as well as technological innovations must be leveraged for the continent, given that these are major value creations and key ingredients for competitiveness”. Since its inaugural launch in 2011, IPA has attracted some 3000 applications from 49 African countries. Jean Claude Bastos de Morais, AIF Founder and the brainchild of the Prize, now in its fourth edition, is pleased with the level of innovations this year – a total of 925 applications from 41 countries. Commenting on the role of IPA in fostering innovation in Africa, Jean-Claude Bastos de Morais said:“I am truly impressed with this year’s winning innovations, which have once again surpassed expectations. At the same time, I am aware that the buck cannot stop here. Let us put it this way; no matter how high a bird flies, it always needs a nest, a base to come back to. African innovators are taking flight, their innovative ideas are increasingly proving to be transformative – not only for Africa – but for the world. Through the IPA, the AIF is fostering the development of robust innovation ecosystems, which are essentially nests for African entrepreneurs and innovators to develop solutions for African challenges”. African innovators continue to provide more innovative African solutions to address African problems. This year’s winners have a common theme: their innovations highlight the vital and crucial need to respond directly to demanding community needs – the heart of the AIF mandate. The innovations further demonstrate great potential to change the course of history in Africans’ responses to health, technology, enterprise and the agricultural sector, prioritizing needs-based responses through cost effective means – a critical tool for sustainable development. The IPA 2015 Awards ceremony was attended by more than 400 people that included high level African dignitaries, ministers, ambassadors, AIF partners, past IPA winners, venture capitalists, innovators, entrepreneurs, local and international media, and young people. The AIF believes that young people (below age 35) are the epi-center of the African innovation ecosystem as they represent 65% of Africa’s 1.1 billion population. For the first time this year, all nominees received recognition through a US$5 000 voucher as a support fund to boost their different innovations in their home countries. The IPA 2015 Awards ceremony was compered by Lerato Mbele of BBC Africa Business Report fame. Youssour N’Dour, the Senegalese musical legend provided first class entertainment, backed by Bob Maghrib, a Moroccan ensemble, with popular Bob Marley renditions. IPA associated events prior to the Awards ceremony included a Press Conference, an Innovation Marketplace showcasing Moroccan home-grown talents, and an Ideas Machine workshop focusing on unleashing innovation talent in young Africans. Related Article: Who wins African Innovation Prize?